Located among three valleys (Casentino, Valdarno and Val di Chiana), the city of Arezzo, capital of the province, has a long and illustrious history. It is currently an active commercial and agricultural center, with textile, footwear and mechanical factories. Also notable is the artistic and cultural heritage of the city. Worthy of a visit are the Duomo (cathedral of Arezzo), the Basilica of St. Francis, the Medicean Fortress, Cimabue’s Crucifix, the Roman Amphitheatre and the Archaeological Museum. Arezzo was home to important artists, such as architect Giorgio Vasari and poets Guittone d’Arezzo and Francesco Petrarca. Moreover, Arezzo is one of the major gold districts of Italy, as its goldsmith crafting is appreciated all over the world. Among the most important events are the Giostra del Saracino, one of the most famous historical and folkloric event in Italy, and the Antiques Fair, an important monthly event that attracts many enthusiasts and collectors. 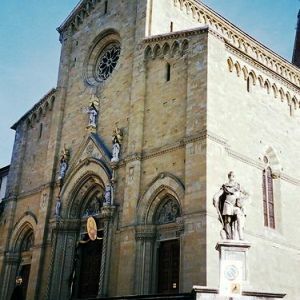 From Arezzo, you can reach many places of historical, artistic and naturalistic interest with comfortable day trips by train or bus. The Christian church of St. Peter Martyr had already become a bishopric in the early 13th century. This recognition was the push for the construction of a larger building. 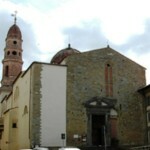 Construction began at the behest of the bishop Guglielmo Ubertini, around 1278. Works were stopped and resumed several times over the years, and they finally ended in 1511. However, the façade, in neo-Gothic style, was completed in the early 20th century. Hence, of the original building remain only the right side and polygonal apse. The interior, adorned with three Gothic-style naves, is illuminated by stained-glass windows of the 16th century, which are mainly the work of William de Marcillat. Numerous and important are the works of art inside the cathedral, along with the frescoes by famous artists, such as Buffalmacco, Salvi Castellucci and the same Marcillat. Along the right aisle, there is the Gothic-style tomb of Pope Gregory X (14th century), and the Pacifier Tarlati chapel, built by John Augustine in 1334, as well as frescoes by a painter from Arezzo who, a few years later, became known as the Bishop’s Master. 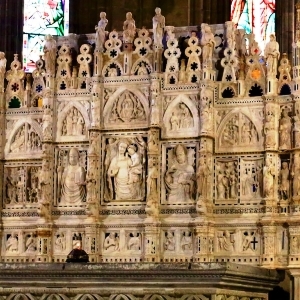 Over the main altar, there is the so-called Ark of San Donato, a marble urn built in the 14th century by various Tuscan sculptors, including the Sienese Agostino di Giovanni and Agnolo di Ventura. On the left aisle, there are frescoes of Mary Magdalene by Piero della Francesca and the cenotaph of Guido Tarlati, Agostino di Giovanni and Agnolo di Ventura. The magnificent chapel of Our Lady of Consolation, of the late 18th century, contains Della Robbia terracotta—particularly valuable is the Trinity by Andrea Della Robbia—murals and paintings. The organ, with entirely mechanical sculpted chest and transmission, was built between 1534 and 1563 by Luca di Bernardino da Cortona, while the large choir is the first work of Giorgio Vasari, who, at the time, was only 24 years old. The Basilica was built on a pre-existing medieval religious building. The church, inspired by the austere lines and the Tuscan-Umbrian Gothic style, was developed by the Franciscan friar Giovanni da Pistoia. Constructions on the building began in 1318 and completed in 1377. The façade, offset by beautiful stained glass rose window and designed by Guillaume de Marcillat (1524), has remained unfinished. The bell tower is from the late 16th century. Unfortunately, part of the frescoes along the nave walls were damaged by the changes occurred in the 17th century, as well as the adaptation of the building as a barracks during the Napoleonic era. Construction of the building, which includes elements of transition between the Romanesque style (portal) and Gothic, began in 1275 and was completed in the early 14th century. At the end of the 16th century, substantial alterations were carried out in the internal part, thus covering up the original frescoes. The interior has a single nave covered with trusses, containing numerous fragments of frescoes from the 14th and 15th centuries, among which those of Spinello Aretino (the most important is an Annunciation) and his son, Parri Spinello. Above the main altar, there is a wooden crucifix painted by Cimabue in his youth, widely considered one of his 13th century painting masterpieces. In a niche, there is a glazed terracotta by Giovanni and Girolamo della Robbia. Cross-shaped and painted in tempera and gold on wood, the Crucifix dates back between 1268 and 1271. The importance of this work lies in the fact that this was the very first work attributed to the Master, and it mirrors a departure from the Byzantine style to greater expressionism. The in-depth parallel research to the restoration of the Crucifix and diagnostic investigations have been recorded in a media system. 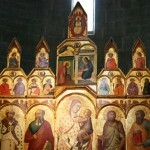 The permanent exhibition “Cimabue in Arezzo – The crucifix restored” retraces all stages of the restoration (www.cimabuearezzo.it). 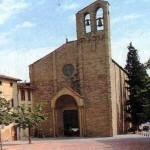 The Pieve was built during the early Christian era and is one of the finest examples of Tuscan Romanesque style. The building had already been completed at the beginning of the 11th century and was the subject of two remakes with the addition of the Romanesque style façade from Pisa and Lucca. In the elegant façade, completed in the 13th century, were two items belonging to the previous building: in the lunette on the portal, there is a relief depicting the Virgin between two angels (1216), attributed to the sculptor Marchionne, and the sculptural composition, depicting the cycle of months. Inside the crypt, there is the bust-reliquary of San Donato, patron of Arezzo, executed in 1346 by goldsmiths from Arezzo. The bell tower, also called “bell tower of a hundred holes” due to the presence of forty mullioned windows distributed over five floors, was completed in 1330. It originated from the merger of two previous buildings, of which it is difficult to identify the original elements. In fact, the portal is of the small oratory of a religious brotherhood, whose construction dates back to the mid-14th century. This aggregate was a hospice for pilgrims. Following a miracle, the tearing of a terracotta statue of the Madonna found in the hospice, it was decided to build a new and larger church. The project seems to have been drafted by Bartolomeo della Gatta and work began after 1490, incorporating all the other pre-existing structures. In 1502, the direction of the work was assumed by Antonio da Sangallo who, during construction, made some changes in concert with his brother Giuliano. Following further modification, the work went on slowly and ended in the late 16th century. Among the most significant works, we find the Virgin appearing to St. Francis and attributed to Pietro da Cortona (1641), the Madonna with child, terracotta of the 15th century by Michele da Firenze, the Deposition, an early work by Giorgio Vasari and designed by Rosso Fiorentino, and the Adoration of the shepherds by Nicholas Soggi (1521). Noteworthy are also the twelve windows, half of which are attributed to the work of Guglielmo de Marcillat (1520-1525). The shrine was originally a water fountain – fons Tecta – that, in the Etruscan-Roman period, was consecrated to Apollo. 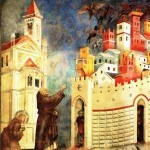 In 1425, San Bernardino of Siena attempted to destroy the fountain. Away from the city, the religious returned three years later, this time succeeding in his purpose and encouraging the construction of a chapel. The project of the first building, in late Gothic style with a single nave, was undertaken by Domenico del Fattore. Throughout the 15th century, the small church was subject to interventions, which ended in 1443. Other buildings were also built afterward. Between 1478 and 1482, Benedetto da Majano leaned against the church a splendid façade porch with seven arches, supported by slender Corinthian columns. A “starry sky” finishing the ceiling was completed in 1495. The interior of the church contains remarkable works of art. Of particular grandeur and beauty is the altar that frames the fresco of the Madonna della Misericordia, commissioned by San Bernardino and painted by Parri Spinello roughly between 1428 and 1431. The painting was later added to the marble altar made by Andrea Della Robbia (1487-1493). In 1695, the church was entrusted to the monks of the Order of Discalced Carmelites who have retained, except for some interruptions, its ownership, up to the present day. The construction was done in several stages, starting with the Gothic of 1278 coinciding with the management of the Benedictine monks from Monte Cassino. Starting from 1565, the church, in particular its aches and domes, was completely transformed by Giorgio Vasari, and the interior was divided into three naves. In 1650, the Baroque octagonal bell tower was completed. Of note, as works of art, the St. Lawrence fresco painting in the counter by Bartolomeo della Gatta (1476), and the large cross painted on shaped wood by Marco di Bonaventura (1319). The presbytery is dominated by the monumental altar-tomb, built by Vasari. The apse painting of the Assumption is also Vasari’s work (1567). A masterpiece of Baroque artifice is the fake dome painted on canvas by Andrea Pozzo in 1702, and placed above the main altar. Inside the church, there is also a delicate marble ciborium, attributed to Benedetto da Maiano. In 1489, the cloister, one of the finest Renaissance architecture of the city, was built and probably designed by Giuliano da Majano. The Praetorian Palace was built on pre-existing structures and further modified between the 14th and 16th centuries. At first, the Palace was the seat of the mayor, the Captain of Justice, and then the vicars appointed from Florence, many of whom remembered by emblems affixed to the façade. The central portal is decorated with a bas-relief of a warrior on a horseback (13th century), which is said to be the oldest coat of arms of the city of Arezzo. Currently, it houses the town library, where there are documents dating back to the 12th century onwards. The Priori Palace dates back to the 14th century and is marked by a strong quadrangular tower—built in 1337, but altered several times, including the installation clock in 1468—and a large loggia with three orders. The medieval building has been unchanged and preserved. 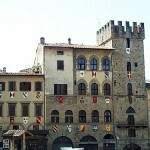 Only the façade along Via Ricasoli has been enriched with coats of arms of the mayor and commissioners. 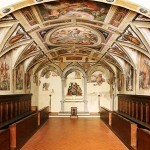 Inside, there are frescoes by Parri Spinello and Teofilo Torri, paintings by Giorgio Vasari and other artists from Arezzo, all works created between the 14th and 16th century. It is currently the municipal administration. The construction was undertaken in the late 14th century by the Florentines Baldino di Cino and Niccolò di Francesco. Between 1433 and 1434, the top was completed by Bernardo Rossellino, whom we owe the statues in the niches and the Madonna della Misericordia bas-relief in the main entrance bezel. The façade presents a mixture of Gothic and Renaissance elements; its crowning was built in 1552 and designed by Giorgio Vasari. The clock, which dates back to the 16th century, marks the days, the lunar phases and the motion of the sun according to the Ptolemaic conception. A legend relates that Felice da Fossato, the manufacturer of the ingenious mechanism, was blinded so that he could never make another one. 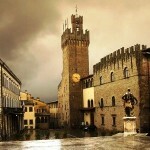 It is the oldest square of the city where many buildings bear witness to 800 years of history of Arezzo. Originally used as a market, it became the political center in the thirteenth century. It has a trapezoidal plan on an incline. Even in the lower part protrudes the apse of the parish of St. Mary. Alongside this the Palace of the Court (centuries 17th-18th) and the Palace of the Lay Fraternity (15th century). Around the northern side it is occupied by the gallery, dominated by the homonymous palace. 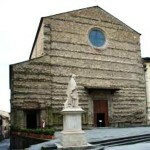 The building, begun in 1573, was entrusted to Giorgio Vasari. Upon completion of the entire structure were also made, with access from the porch, elegant “workshops”, largely still exist in the original structure. 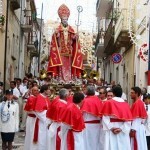 Twice a year the square is the scene of the traditional Giostra del Saracino. It has also been the backdrop for some shots of the Oscar-winning film “Life is Beautiful” by Roberto Beningni. 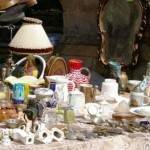 Hours: Monday to Saturday 9:00 am – 8:00 pm and the first Sunday of the month coinciding with the Antiques Fair. 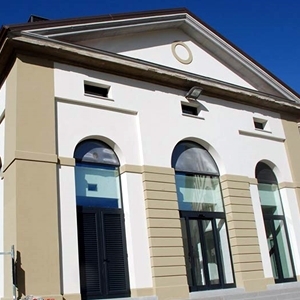 Lodges of Wheat, the historic 19th century building, has recently been renovated to house a modern and dynamic market for food and agricultural products, mostly from organic agriculture, typical of the area. Inside the building, there is room for olive oil and wine tasting, as well as many other excellent products. Courses and lectures on healthy eating are also held there. These are natural reserves that extend in the municipalities of Arezzo, Civitella in Val di Chiana, Laterina, Montevarchi, Pergine Valdarno and Terranuova Bracciolini. They were formed during the mid-20thcentury, following the construction of a dam. This has created an environment characterized by small lakes and wetlands, ideal for the spread of tree species and the reproduction of many animals. Particularly interesting are the paths that run through the Valle dell’Inferno and the Rondini. In spring and early summer, it is also possible to observe nesting birds, while in autumn and winter it is possible to watch them migrate towards warmer weather. Tours are organized to provide useful information, including participation in educational and cultural activities. 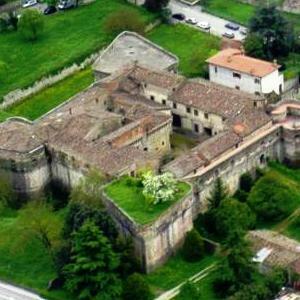 Not far from the Arezzo exit of the “Autostrada del Sole” (A1) is a small village dominated by the Battifolle Castle. The castle (dating back to the 11th century and also known as Castel Pugliese) was one of the most important strongholds of the Arezzo countryside, thanks to its position from which it was possible to control both the Valdarno Aretino area and the Val di Chiana. The ancient castle can be reached by climbing about half a Km from the church Battifolle. Currently, the castle is visible only from the outside. Located a few Km south-west of Arezzo, the village is known for the discovery of a skull of Homo Sapiens, who lived in the Middle Pleistocene era. 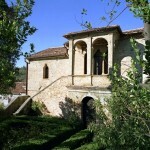 On the border with the neighboring village of St. Anastasius is the historic Villa Mancini. The town is the starting point for various hiking trails, on foot, mountain bike or horseback, leading to the Mount Lignano. Built between 117 and 138 A.D., the amphitheater has an elliptical shape and stands on two levels with an alleged capacity of over 8,000 spectators. Of the actual structure, built using sandstone blocks, bricks and marble, remains only the ambulatory and access stairs. The amphitheater has suffered several looting over the centuries and some of the material was used to build other religious buildings. It is currently used as open-air theater. The museum is dedicated to Gaius Maecenas, a leading figure at the time of the Roman emperor Augustus. 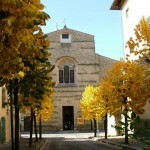 It is located in the former monastery of San Bernardo, built in the early 16th century near the amphitheater. The museum displays relics from the Villanovan, Etruscan, Roman, until the so-called “Hellenistic” period. Among the most valuable pieces stand out the jewels from the necropolis of Poggio del Sole, a carved pediment and polychrome with fight scenes (480 BC) and a series of votive portraits dated between the 2nd and the 1st century BC. A large section of the museum is dedicated to the so-called “sealed earth”, the ceramic pottery made in Roman times (between the 1st century BC and the 1st century AD). 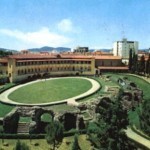 Arezzo was the most important production center of the Mediterranean. In this Museum, there are frescoes, paintings and Romanesque sculptures dating back from the 11th and 16th century, as well as Liturgical furnishings from the Dome and the entire diocese, made anywhere between the 12th and 19th century. Among the most valuable works of art, there are three wooden crucifixes of the 12th century, an Annunciation on a panel by Andrea di Nerio (14thcentury), frescoes by Spinello Aretino and his son Parri Spinello. There is also a detached fresco, St. Jerome in the Desert, by Bartolomeo della Gatta (15th century) and two banners made by Giorgio Vasari. Noteworthy among the jewelry are the so-called Peace of Siena, made by a Flemish goldsmith in the 15th century, and a cross made of rock crystal from Venice but mounted in gilded silver from a Tuscan artisan in 1466. It is situated in the Renaissance Palazzo Bruni-Ciocchi, one of the most prestigious noble buildings of the city built in 1445 on behalf of Donato Bruni. The museum displays sculptures, paintings, pottery, porcelain, gold, bronze and glass objects of medieval and renaissance eras. 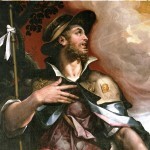 In the rooms dedicated to paintings are present, among others, important artists such as Bartolomeo della Gatta, Margarito d’Arezzo, Spinello Aretino and his son Parri Spinello, Ludovico Carracci. Noteworthy are also some tables by Luca Signorelli, including the Madonna and Child with Saints and St. Jerome. 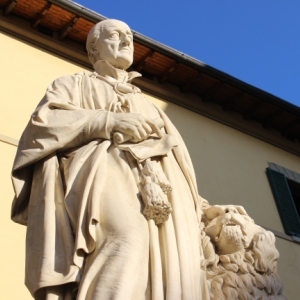 It was here that, in 1304, the poet Francesco Petrarca, one of the architects of the Italian language, was born. However, the current building is the result of a 16th century reconstruction and other renovations took place in later centuries. 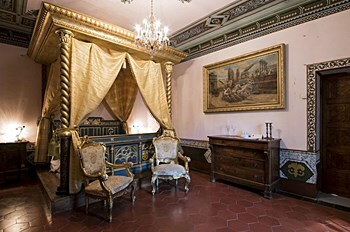 Currently, there is the seat of the Petrarca of Letters, Arts and Sciences, accompanied by an extensive library. In front of the house, there is a well that probably gave the writer the inspiration to one of his most famous short stories, the “Tofano Pozzo”. This was the home of the painter, architect and art historian Giorgio Vasari, whose formation was strongly influenced by Michelangelo and Andrea del Sarto. The artist bought the house in 1540, dealing directly with the finishing work, decoration and furnishing. In addition, the artist personally frescoed part of the interior: on the ceiling of one of the rooms, Vasari painted the Fama, the corbels and the lunettes of the Four Arts. In the fresco Allegory of conjugal, located in the so-called Apollo Room, the artist portrayed his wife, Nicolosa Bacci. Among the other frescoes, there are the self-portrait and portraits of famous artists born in Arezzo. 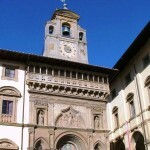 Currently, the building is also home to the Vasari Archive containing documents of great historical value, including letters written by Michelangelo, Cosimo I Medici and Pope Pius V.
The museum contains a historical collection with more than 500 works, including jewelry, some of which are unique pieces, designs and creative projects from the goldsmith company known as Unoaerre. The exhibition space also includes old machinery that goldsmith applied to the industry. The Arezzo area is famous for gold processing techniques inherited from the Etruscans and unique jewelry of great artistic quality are largely produced in this area. Throughout the year, there are two events dedicated to this high-level crafts: OroArezzo and the Biennale of Art Goldsmith. This is a historical event, which represents the competition among the four districts of the city—Porta del Foro, Porta Crucifera, Porta S. Andrea and Porta S. Spirit. The tournament takes place in Piazza Grande (Piazza Vasari) and is preceded by equestrian evolutions and performances of flag-wavers. 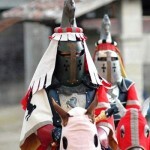 The race itself is supported by a knight with a lance: he must hit the shield of a wooden statue representing the Saracen, or “Buratto, King of the Indies”. 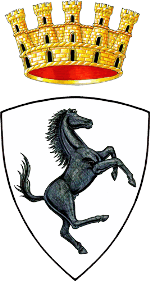 The pair of knights who, in striking the shield, achieves the most points wins, while the winning district is instead awarded the “golden spear”. 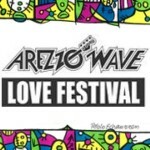 This is a rock event that has become a reference point in Italy for new musical trends, new international proposals and prestigious springboard for emerging groups. Organized for the first time in 1968, this is one of the most famous events in the sector in Italy. The focus is on Piazza Grande (Piazza Vasari), but the exhibitors also occupy adjoining streets. Hundreds of vendors, also from other regions, exhibit furniture, paintings, gifts and collectibles. For the occasion, all the antique shops and the main shops in the city are open to the public. The area where the city is currently located has been inhabited since prehistoric times, as confirmed by the discovery of the skull of a Homo Sapiens (the so-called “Uomo dell’ Olmo”). In the 9th century BC, there was already an Etruscan settlement; between the 6th and 5th century, it had already become one of the major centers of this civilization. To this period belong works of art of exceptional value, such as the Chimera. In the 3rd century BC, the city had succumbed to the expansionism of Rome and took the name Arretium. 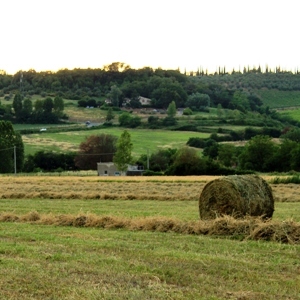 It soon became a center of primary importance because, through the Via Cassia, the city became a must in the connections between northern Tuscany and Rome. At the beginning of the Imperial Age, the city became quite rich and numerous public buildings were built, such as the theater and baths. Arezzo was also an important center for the production of bronze objects and pottery vessels, called “coral” for their color. 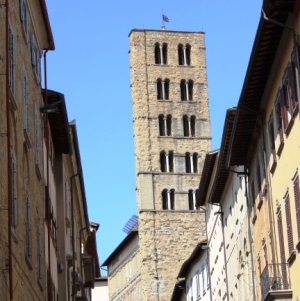 With the dissolution of the Roman Empire, the prestige gained and the favorable position on the Via Cassia made Arezzo a significant city during the Middle Ages. During the subsequent Kingdom of the Franks, it became of considerable importance to the Episcopal Church and, for this reason, numerous monasteries were built. At the beginning of the 13th century, the city became a free city, rapidly expanding its influence in the Lower Casentino, the Upper Tiber Valley and the Val di Chiana. At the same time, there were significant cultural changes, such as the construction of the University, as well as the stadium. 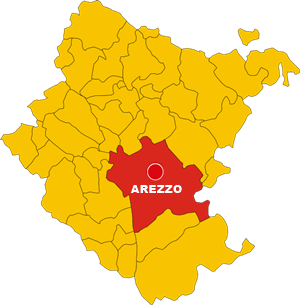 The continued expansion of the city of Arezzo became cause for jealousy in neighboring cities, which wanted to mirror its grandiose status. Therefore, confrontation with two nearby Tuscan cities, Florence and Siena, became almost inevitable. After defeating the army of Siena approaching dangerously, Arezzo, traditionally linked to the Ghibelline party, suffered a severe defeat at Campaldino (1289) by the army of Guelph Florence and its allies. Nonetheless, after its defeat, the city expanded the city walls, concluded an honorable peace treaty with Florence and even managed to ally with Siena. At the beginning of the 14th century, growing divergences against the ever rival Florence were manifested, and culminated in the complete loss of independence in 1337. However, the city’s independence was quickly restored in 1343, although it did not prosper. Moreover, in the second half of the 14th century, bitter internal struggles between Guelphs and Ghibellines began, and the city was sacked several times by both sides. The final blow was given by a mercenary army hired by the Ghibelline party, who conquered what remained of Arezzo. In 1384, the city entered permanently into the sphere of Florence, whose influence can also be recognized in the architecture, which was followed by a slow economic and cultural decay. The oldest part of the settlement, including the fortress and cathedral, was deeply changed and the fortress, an early example of modern fortification, rebuilt and enlarged by Sangallo de Medici. In 1525, the city and was struck by plague, to which followed famine that completely devastated the economy. As a result, in 1529, the city of Arezzo was once again about to rebel against Florence. The Medici family, who were about to hold absolute power, had no more reason to keep Arezzo separated from the rest of Tuscany, and sent an army to take definitive possession of the territory. Then, the Grand Duke Cosimo I Medici, issued the urban renewal plan for defense purposes. 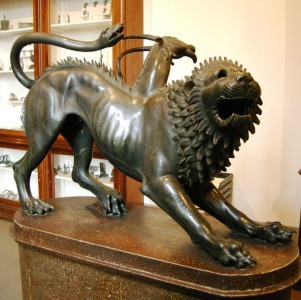 It was during these works that famous statues of Minerva and Chimera bronze, both Etruscan, were unearthed. From the second half of the 16th century, however, in all of Tuscany, a slow but inexorable economic and cultural decay, accompanied by demographic decline, spread. This terrible phenomenon was reversed only during the mid-18th century, thanks to the initiatives taken by the Grand Duke Peter Leopold Habsburg-Lorraine. 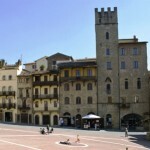 After the Napoleonic period, Arezzo became a provincial capital in the restored Grand Duchy of Tuscany. In 1860, together with the entire region, the city became part of the Kingdom of Italy. During World War II, the bombing destroyed almost 60% of the buildings, and in the following years, the city’s economy was simply based on cultivation of the surrounding countryside. Subsequently, the city’s industrial vocation has found new outlets in the textile sector, in the processing of hides and precious metals, especially gold. Chianina: breed of cattle among the most prestigious and oldest ones in Italy, recommended for cuts of red meat on the grill. Services offered: Production and sale of fresh truffle and chestnuts, accessories, research tours, and other products. 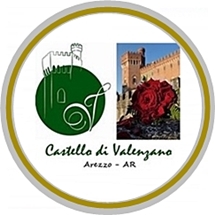 Castello di Valenzano is just a few minutes from Arezzo in the municipality of Subbiano. Set in a beautiful valley near the park of Foreste Casentinesi, it is a home of millenary origins dating to the 9th century, although it suffered several restorations and renovations over the centuries. 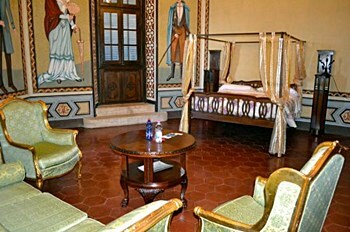 The castle hosts a cozy residence and an elegant restaurant for weddings, events and meetings. 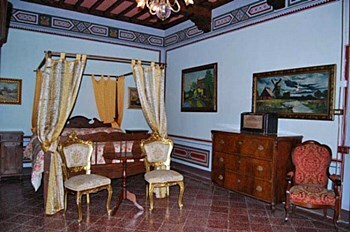 The rooms all have private marble bathrooms and are decorated in different styles. Most rooms have a panoramic view of the Pratomagno peaks. 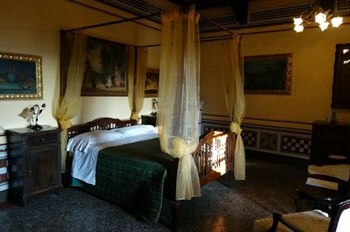 The rooms do not have a TV, minibar, air conditioning and telephone. 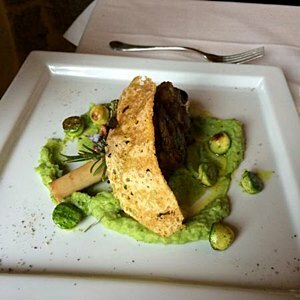 The heart of the castle is the restaurant, characterized by typical Tuscan cuisine, but enlivened by chef Simone Brodoloni and his collaborators who select monthly recipes for their creation, revisiting traditional dishes of traditional cuisine. All the pasta served in the restaurant is made directly in the kitchen of the castle, with the highest quality products. Only fresh and seasonal products are used. 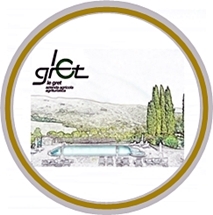 There are always dishes prepared for people intolerant to gluten and their own products (pasta, bread, …). In the summer, the construction of a vegetable garden inside the castle walls allows “working” directly grown products (tomatoes, aubergines, cucumbers, peppers, salads, …) without the use of chemicals and in full respect of nature. In addition, the use of the Chianina breed and the choice of different types of meat, from white to sheep, through gambling, offer customers a rich variety of dishes. The cost of the dishes ranges from 10.00 to 18.00 euros. 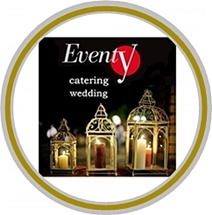 Wedding at Valenzano Castle is like getting into a fairy tale. In fact there is a consecrated church inside the walls of the castle where, with the necessary permission of the competent diocese, religious functions such as baptisms, weddings, etc. can be celebrated … The square opposite the main facade, the cloister, the church, salons and park are special places for photographs of event memories. . Depending on the needs and the numbers of participants, bridal lunch is served in one of the large salons, which can accommodate up to 300 people. The Bridal Suite is free for the first night of wedding. The rooms used for weddings can accommodate any other event such as meetings, conventions, fashion shows, product presentations. 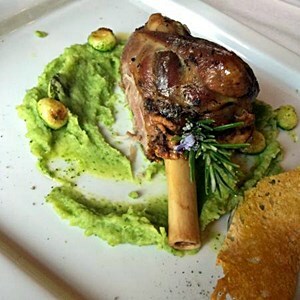 Services: traditional Tuscan cuisine, extensive and impressive wine cellar, pizzeria, terrace.